but those are now diagnosed and made right so the plant is delivering as, or better than, designed. It is dumbfounding how so many renewable-energy opponents agree with having a military ship undergo sea trials, where systems are tested and verified, then repaired or altered where necessary to obtain the desired performance. Yet, a first-of-a-kind solar thermal power plant is, according to them, required to produce per design from the first day of operation. Otherwise, it is a sheer waste of money. Clearly, there is a double standard at work. Cooler heads prevailed in the Ivanpah solar project, with the California regulators understanding that a faulty mechanical part was identified and corrected and the plant's output would increase to the required amount. Now, as the sun pours down its free and essentially eternal energy into the California desert, the plant produces valuable electricity during the grid's time of greatest need, the mid-day peak. 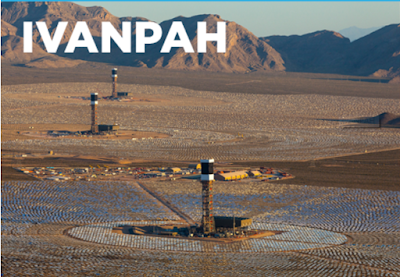 Earlier posts on SLB on the Ivanpah solar power plant are here and here.